You work hard at keeping your kitchen green -- buying healthful, sustainable food and drink to nourish your family and friends. Good for you! Now here’s another area where you can make a positive difference to our planet. Make sure that your kitchen cabinets, as well as their contents, are eco-friendly, locally produced whenever feasible, and constructed from sustainably produced or harvested substances. Whether you are planning to install new kitchen cabinets or upgrade your existing ones pick and choose from these 7 tips to minimize your impact on the health of Mother Earth. Reuse. Reusing what you already have is one of the basic principles of an environmentally mindful lifestyle. 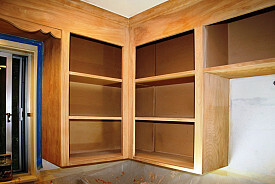 Repair damaged kitchen cabinets if possible, to extend their usefulness and postpone the need to purchase new material. Often cabinets which are somewhat the worse for wear can be renewed by changing the hardware or stripping their finish and redoing with water-based stain or paint. Reduce. If your present cabinet doors are a little (or a lot) battered, you might need to take more serious steps to make your kitchen functional once again. You can make choices that will reduce the amount of new materials you’ll need, though. Consider simply refacing the cabinet surfaces or replacing just the doors themselves, while preserving the boxes. Recycle. Recycling venerable old wood (salvaged from barns or fences that have been torn down or fallen on their own) is not only praiseworthy, it will also give your kitchen a very appealingly weathered rustic look. Do be sure to ask permission before bringing home wood from a demo site or a pile of discarded pallets; it may not be free for the taking. And check whether wood you plan to reclaim is safe – free of mold, rot, or insect infestation, to name just a few examples. Replace responsibly. If none of the previous suggestions works for your situation, you might decide that your cabinets’ life is done and it is time to look for an appropriate replacement at last. Should you decide to install new kitchen cabinets, select natural materials, preferably ones that have not been transported long distances to where you live. Durable, beautiful wood, such as oak, cherry, or mahogany is a good choice; look for Forest Stewardship Council certification that it was sustainably sourced. A new hybrid wood, lyptus, is fast growing and can be harvested without damaging the surrounding environment. Research other materials for their green potential. Bamboo has become a popular, less expensive, alternative to wood; however, recently questions have started to be raised about its sustainability. In addition, bamboo planks may contain a formaldehyde-based adhesive. A promising new source for cabinet construction is actually farm waste. A process has been developed to transform the debris which is left over from harvesting sorghum, sunflowers, or wheat into attractive fine-grained boards. Recycle once again. Don’t just discard your old kitchen cabinets after they are removed. You may be able to donate them to your local branch of Habitat for Humanity or at least drop them off at the salvage center. Remember the details. Opt for environmentally sound materials to craft the interiors of your kitchen cabinets, as well as their faces. Avoid using any toxic adhesives or finishes that will off-gas VOCs (volatile organic compounds) into the air of your home.